Alida was born November 24, 1862 in the town of St-Damase, province of Quebec, Canada. She and Almeric married September 13, 1887 also in St-Damase. They came as a family to the United States in 1907. Alida outlived her husband by about 7 years. She died in Chicopee, Massachusetts February 27, 1933 at the age of 70 years. 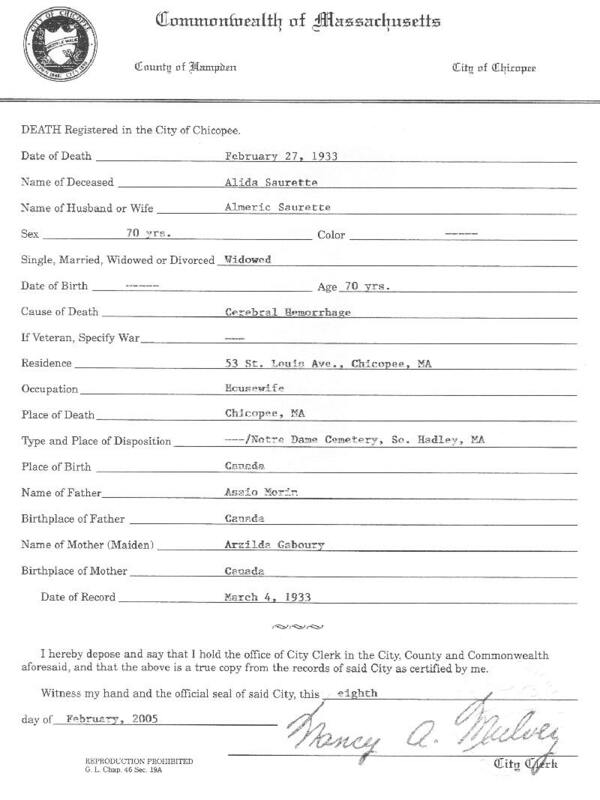 Below is a copy of her death certificate. Of note is that they have her father listed as Asaio Morin. His name was actually Isaac Morier – that I have confirmed by other records, plus her last name on the tombstone is also listed as Morier.